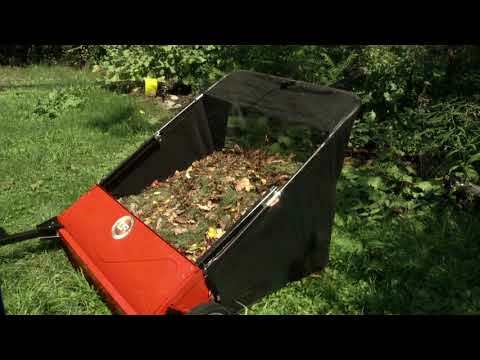 Sweep up grass clippings, fallen leaves, and more with this handy time-saver! Attaches to your lawn tractor to eliminate the need for back-breaking raking. An ingenious high-speed brush to wheel ratio system spins rapidly, sweeping up lawn litter and filling the hopper (up to 26 cubic feet). Tow it behind your lawn tractor and watch leaves, twigs, and grass clippings get whisked away. The Lawn Sweeper does exceptionally well cleaning up the lawn and even driveways! Shipping Dimensions 53.5" x 17" x 18.5"
Recommended Towing Vehicle Fits any lawn, garden and yard tractors with a rear hitch pin. Very Happy with this lawn sweeper. Assembly went well took a short time to figure out height adjustment for the bristles but after that my Wife and I agreed we should have had one of these units years ago. I would recommend it to anyone who has a lot of leaves to deal with, it is a real back saver. We live on 72 acres and needed something to help clean up leaves and also get brown matter for composting. This lawn sweeper works fabulously! Within 15 minutes we had 12 piles of leaves. I was surprised at how much more this unit sweeps up than my previous sweeper. One thing that was a problem: the rope that came with it was too short to use. I could not tie it to my riding mower. I replaced the rope with a longer one and it works great. It store in much less space than my previous sweeper. This sweeper takes getting to know. There's no motor, so it took me a few trips to understand the mechanics and why the wheels kept locking up grass was too high and wet. I also thought the wheels were coming off, because they're angled out a bit, but I think that's by design. Now that I understand how the brushes are driven, and the optimal height to set them at, I absolutely LOVE this sweeper. It is incredible, and actually works better at picking up small branches, walnuts, debris, thatch, than the video shows It's not cheap, but you get what you pay for. The collection bin is HUGE, and dumping the debris is actually easier and cleaner than the video shows. I back up to a tarp and dump the leaves right onto it. It's really fun. I de-thatched my lawn last week, went back over it with this sweeper and everything was gone. ONE COMPLAINT: I'm a 58-y.o. woman, who is fairly mechanically inclined. and pretty good at following instructions. It took me two evenings about 3 hours to assemble this sweeper, mainly because the instructions like all DR instructions are just barely comprehendible, in my opinion. I wish they would put more resources into those documents. Maybe make more how-to videos. Anyway, this thing is amazeballs. I now own the gravel grader, the field/brush mower, the drag harrow, and this sweeper. Great quality across all of them. I hope this review will be helpful to someone considering this sweeper. I have owned two other lawn sweepers, an Agri-Fab 42” with 10 inch brush diameter and a Brinly 42” with 11 inch brush diameter. Compared to these other two models the DR is in a league of its own! It’s fully adjustable where the other two are fixed and that’s just the beginning of its advantages. If you haven’t owned a lawn sweeper before one of the main features you want to look for is brush size diameter of sweep motion and gear ratio these two things combine to create the ability of the sweeper to lift things off the lawn and hurl them into the bag, this DR does the best job of any sweeper I have ever seen or tried. My Brinly swept pretty well but was a pain to dump and at near 300 bucks was hugely disappointing in the quality department, with less than 30 uses, the bag frame had broken in multiple spots and two brushes have been thrown from the sweeping axle and bent, plus it would jump out its height adjustment if it bounced around while sweeping…. its now in the city dump! The cheaper Agri Fab has held up a lot better but its small brush diameter doesn’t allow it to get enough lift to really do a great sweeping job, it will only fill its bag about half way before it piles grass up on its transverse support bar and quits collecting grass in the bag, so you are constantly dumping it which is a pain with its fixed bag Brinly has fixed bag also which I had to modify to be able to lift it off to dump it, plus its very light weight which causes the wheels to lose traction sometimes and thus it quits sweeping in some situations. This DR is solidly heavy the way it needs to be and it sweeps up everything in the yard, the height adjustment is easily changed and stays locked in place unlike the other two sweepers, and the flow through bag actually works allowing the entire bag to be filled before dumping. I actually sweep my whole yard and dumped once verses the Agri fab which would have required 5-7 dumps to do the same job. The quick release bag on this DR is my favorite feature! All these sweepers come with a rope you can use to supposedly dump the bag while you remain seated on the tractor, well this works ok but it’s truly a pain to try to back up any sweeper up and get it into the right spot to dump it if you have a specific place you want to put the load. I use my collected grass clippings for Organic Style gardening, i.e. I dump my grass around my garden plants to keep weed growth down, keep moisture in and around my plant roots and as it composts it provides natural fertilizer for be garden soil a win, win, win, scenario but you can forget trying to maneuver a garden tractor and sweeper full of grass clippings in the soft garden soil and dump it in a specific spot and that’s where the DR quick release bag is the best thing ever created on a sweeper. Two spring released latches allow the bag to be detached in 2 seconds downside is it will be so heavy from what’s its picked up this will likely be a two person job, a good problem to have in my opinion -: then you can carry the bag anywhere and dump or spread out your clippings! This feature alone made this worth buying. When you add up all the other features this DR has it really becomes a no brainer, yes it’s a little more costly than the others but you get what you pay for and since it was only about 60 on sale more than the now in the city dump Brinly plus the near 200 I paid for the Agri fab it really makes no financial sense to buy those cheaper models… The “a poor man can only afford the best” proverb really applies here! Get this sweeper and you will be glad you did! I ordered this sweeper from the reviews I read. I was able to assemble it in 30 min. Then trying it out after I assemble it. It performed better than I expected. I'm very happy that I purchased this well built equipment. Well built durable lawn sweeper. The directions for assembly were quite good. However, got to admit that it took me about 3 hours to complete the job, not being mechanically inclined. I have lost a few assembly pins while sweeping, slightly irritating. I used to rake up dried grass from my pastures a day, or two, after mowing..This grass "hay" is awesome for laying hen nesting material, but it was back breaking work..Now, with the DR lawn sweeper I can pull it behind my lawn tractor and gather as much as I'm ever going to need.. Lawn finally dried out enough to attempt a first spring mowing. The sweeper worked extremely well collecting the damp cut grass and remaining damp fall leaves. Easily adjustable in height and a breeze to empty. Assembly of this item is not as straight forward as DR may think. There is no narrative to go along with the sketches that are provided. But I got it done. During assembly I noticed the wheels would not turn while on my concrete carport--brushes were set too low to allow them to turn so the wheels just dragged. This truly becomes a problem while trying to use the sweeper as the lowest 8-10 settings provide the same problem with the wheels dragging. What good are a dozen height settings if only the top two are of any use? The wheels will also stop turning and just drag along the lawn if only a little lawn debris is pulled in front of the wheels. The item is marked for use only with a lawn tractor suggesting a ZTR would be too fast to tow the sweeper which would cause damage. This is stated on the tongue but not in the advertisement for the item. The front edge of the sweeper is so low to the ground that it catches on any root above the ground and bends the flimsy metal. I had planned to retire my old Brinley sweeper but it is superior to this model. Not worth the extra money in my opinion. I can not recommend this item. Just unboxed this product. Put it together in just under an hour. Had to drill off some of the powder coating in the screw holes. Some small scrapes on the powder coating nothing that wasn't going to get scratched anyway. Directions are for somebody with common sense I had to take mine back apart 3 times. So far this product has me smiling big. Vermont born and 802 strong. Hoping when I get my adjustment set better it does well with the acorns. This is not a toy like the ones you get at the box stores. It's heavy built, easy to put together and works like it should. Upon deliver - was ready to send it back. Opened box & all parts were there but a lot of metal had been bent. No scratches or paint off but edges & brush adjustment plate was bent. After a lot of beating & banging with rubber mallot & a pieve of wood & hammer - all was good. Was having a lot of thatch laying on top of the freshly cut grass - would rake the worse parts of the yard - cut 4 - 5 acres mostly flat land but very rough terrain due to moles & a lot of it had been a nursery. Found this wonderful sweeper & have used it at least 3 times - does a great job & is built with quality material. Would highly recommend to any one. One more thing - when the box arrived one of the brushes was messed up due to disarray of material in the box - was able to straighten it & did ok. Also after the 3rd use I got a little loose with the rope & it chewed wrapped around the brush axle - thinned out a few bristles but was able to us with no issues. Husband decided to get a fresh new set of brushes - called the number & a very nice man answered & helped me to order - he asked me why I was ordering a new set of brushes so soon & I explained. He told me he had two new brushes coming my way & when asked the price he said they were free due to my problems. Thought this was top notch of the company. Will be ordering more merchandise from DR in the future. I already have their burn cage which is a high quality product. Have agreat day! Q.How do you empty the bagging unit? A.Thank you for your interest in the DR 44" Tow Behind Lawn Sweeper. This unit is nice and easy to dump, you wont even have to get off your towing vehicle. When you are ready to dump the debris, simply back the unit up to your desired location and pull on the handle attached to the bagger. This will lift the bagger up and deposit the contents to your pile. Please let us know if you have any other questions. Q.Are the gears metal or plastic? A.Thank you for contacting us. The Tow-Behind Lawn Sweeper has plastic wheel gears that drive the Bronze gears for the brushes. Please feel free to contact us if you have other questions. Q.What is warranty on the sweeper? A.Thank you for your interest in the DR 44" Tow-Behind Lawn Sweeper. The Lawn Sweeper comes standard with a two-year limited manufacturers warranty. You do have the option to extended the warranty to a three year at the time of purchase. Please feel free to contact us if you have any other questions. Q.How much is the offset? Is it enough to allow mowing and sweeping at the same time? A.Thank you for your question. The 44" Tow Behind Lawn Sweeper is offset by sliding the tow bar from one side to the other. This will give you an offset of 44" from the centerline of your tow vehicle to either side. Please feel free to give us a call if you have any other questions. A.Thank you for contacting us. You can purchase the replacement brushes from us. You would need to place the order over the phone with a Parts Rep, they are not currently available on our website. They are currently priced at $11.99 a piece. There are four brushes on the unit. Please feel free to contact us if you have any other questions. Q.How many cubic feet does this hold when full? I noticed that the push lawn sweeper states that it holds 7 cubic feet when full. A.Thank you for contacting us. The 44" Tow-Behind Lawn Sweeper has a unique flow through bag, unlike other lawn sweeper bags, that fills up the entire bag, utilizing the entire 25 cu. ft. of space. Please let us know if you have any other questions. A.Thank you for your question. The 44" Tow Behind Lawn Sweeper weighs 92" Please feel free to contact us if you have any other questions.